Barcelona Ballet (originally Corella Ballet) is in town for its second New York season at City Center through April 20, led by artistic director Ángel Corella, who retires in June as a principal with ABT. At 36, from the perspective of dancing, Corella has peaked despite his perpetual boyish charm. But in respect to running a company, he's still young. 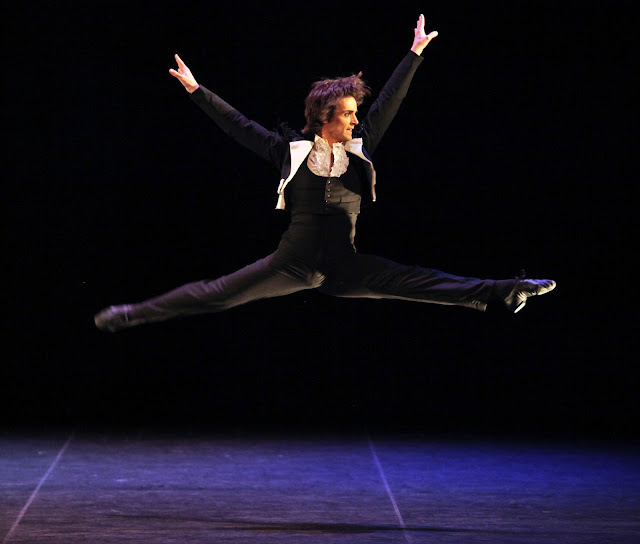 Since beginning a foundation in 2001, and then the company in 2008, more and more of his boundless energy has gone to running the company, and his appearances in ABT's full-length ballets have dwindled. Remarkably, Barcelona Ballet is the only dedicated classical ballet company in Spain, where contemporary-modern ballet is favored. And after seeing the performance on Tuesday, it's apparent that recruitment and training are taken seriously. Corella is reknowned for his joyfulness when dancing, gaining him a loyal and fervent following. It doesn't hurt that his spins and leaps can be unforgettable (when controlled, for their virtuosity; when uncontrolled, for their sheer hubris), nor his Prince Charming looks. But a number of men in his company have fantastic physical gifts. Christopher Wheeldon's For 4, created for a Kings of the Dance program which included Corella, showed off the talents of Fernando Bufalá, Alejandro Virelles, Aaron Robison, and Dayron Vera in a playful, freewheeling series of ensembles and showcase solos. The evening began with Clark Tippett's Bruch Violin Concerto No. 1, for four pairs plus 16 corps members. Tippett, American, danced with ABT and Tharp as well as choreographing. His fairly straightforward interpretation of ballet immediately showed the dancers' solid fundamentals. Each pas de deux was emotionally shaded to compliment the costumes' hues. The elegant (and missed in NYC, albeit formerly buried in ABT's deep ranks) Carmen Corella, sister of Ángel, wore shades of mid to dark blue and danced somberly, and Momoko Hirata—a revelation of sprightliness and confident strength—bright pink, balancing the dusky gold corsets (designed by Dain Marcus) of the corps. The featured work was Pálpito (which translates to "hunch"...? ), a commission by Rojas & Rodriguez to music composed and produced by Héctor González, with outré costumes by Vicente Soler. Meant to evoke the variety of Iberian culture, it also featured Ángel as—paraphrasing the program—an artist trapped in his role as a dancer, kept from pursuing tranquility, peace, and new horizons. Not too much of a stretch, honestly. The ballet offered interesting moments mixed in with some monotony. The seguidilla/tango sections, to strongly percussive music, lit dramatically by Luis Perdiguero, were dutifully strident and quite entertaining. But the fine line between daring and tacky blurred in costume choices, particularly the ones involving the mens' bare chests and neckties, and lots of black lace. Corella will forever appear in the mind's eye as an adorable moppet, huge smile slicing his face—again, why audiences adore him. So in serious roles such as this, at least until the finale, his angst felt forced as he angrily strode about the stage, punching his fists in the air. Yet he hammered home the psychological underpinnings through his physical expressiveness, still robust if fading by faint shades. Re-entering after changing into a yet-puffier shirt, he seemed a changed man, his effervescent smile now completely irrepressible, ready to greet his laudatory fans who will forever keep him in their hearts. There'll be ear-splitting cheers, and plenty of tears, at his June 28 send-off after ABT's Swan Lake, but it's nice to think we'll still be able to see him, or at least his artistic hand, from time to time.